Bay Area rap ambassador E-40 is one of the headliners for Krush Groove at SAP Center. E-40 and Too $hort will team up with Ice Cube, Scarface and other rap music legends for Krush Groove, a concert taking place at San Jose's SAP Center on April 17. 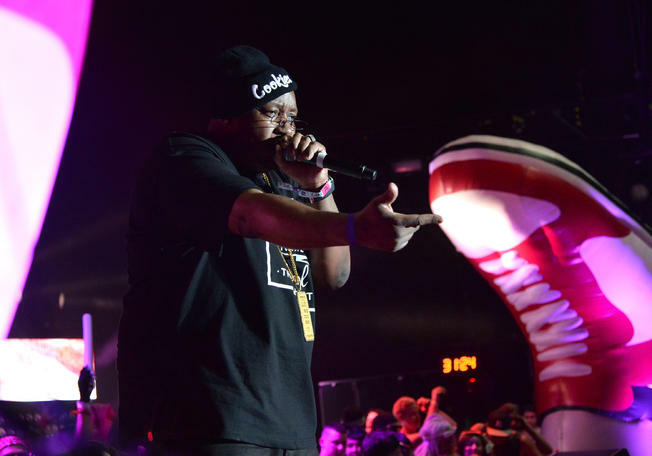 Though they're both indelibly associated with the Bay Area, both E-40 and Too $hort spend the bulk of their time doing concerts in other places. They both tend to play here or make cameos at other artists' shows only a few times a year. A local concert appearance of this size and magnitude is rare for the longtime friends, who finally collaborated together on two albums in 2012. There has long been a perception that large Bay Area venues — and cities — may be resistant to booking E-40 and Too $hort shows. It is a perception that has been fueled in part by the artists themselves. "For some reason, the City of Mountain View won't let E-40 and Too $hort perform," E-40 told Fuse TV in 2012, referring to a rap tour called Rock The Bells that was taking place at Shoreline Amphitheatre. "They can't even give us an excuse or nothing. They can't say nothing. They don't even know why they won't let us perform. They don't want us performing on our soil, man." The City of Mountain View later released a statement to Patch denying any such involvement. San Jose appears to be welcoming these two local and international legends with open arms. Tickets to Krush Groove are $44.75-$140.75 and are available via Live Nation.